Welcome to Commonwealth Worldwide Executive Transportation! Headquartered in Boston since our founding in 1982 - with a fully owned subsidiary in New York City - as well as a vast global partner network, we serve a renowned list of the world's largest, most discerning corporations and clientele. Commonwealth combines distinctive expertise with the ability to deliver tailored services for Financial Road Shows, General/Private Aviation, Entertainment/Production Tours, Corporate Travel and Meetings & Special Events. Our company's career executive drivers and knowledgeable travel coordinators work harmoniously with industry-leading technology to provide each client with discrete, personalized service. Couple this with the industry's youngest fleet of luxury vehicles and you'll understand why clients are consistently delighted with "The Commonwealth Way." For Dawson Rutter, president and founder of Commonwealth Worldwide, the drive to excellence began behind the wheel of a taxi. That is where he saw first-hand how the quality of customer service could make or break a business. After ten years of driving and dispatching taxis, the temptation of driving an air-conditioned vehicle in the heat of the summer lured him to the limousine business. Just a month into his new position as a chauffeur, Rutter jumped at the opportunity to fill in for the vacationing operations manager. The fill-in job soon became a fulltime position, and he quickly acquired the driving, chauffeuring, dispatching and operations experience that enabled him to envision a luxury transportation service that surpassed all of his previous transportation experiences. 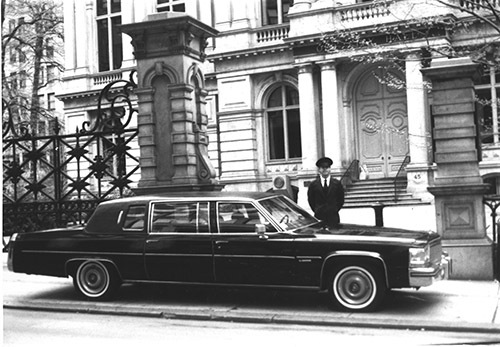 In 1982, Dawson used his savings to purchase a single vehicle, an '82 Cadillac "Formal" Limousine, to be exact. With a clear vision of providing the excellence that was missing in the industry, he built the values of accountability, communication, exceptional customer care, and professionalism into the backbone of his organization. Today, Commonwealth Worldwide serves business travelers in more than 85 countries, and is one of the largest chauffeured transportation companies globally. We look forward to serving you in New York, Boston, or wherever your business (or pleasure) takes you around the world!